Please note that this blog post summarizes peer-reviewed research that has been published in Science Advances. This means that findings presented in the following article are the product of a formal investigation by a team of scientists, which contrasts with more typical California Weather Blog posts that are primarily based upon my own informal thoughts and analysis. I would like to thank my co-authors in this work—Daniel Horton, Deepti Singh, and Noah Diffenbaugh—for their invaluable support in bringing this project to completion. The full paper is freely available to all (via an open access license) here. Citation: Swain, D. L., Horton, D. E., Singh, D., and N. S. Diffenbaugh, Trends in atmospheric patterns conducive to seasonal precipitation and temperature extremes in California, Science Advances, 2, e1501344, 2016. The Ridiculously Resilient Ridge, Oct-May 2012-2015. Quantity plotted is the middle atmospheric pressure (500mb geopotential height) anomaly (meteres). Adapted from Swain 2015, GRL. Since early 2013, the state of California has been in the grip of an extraordinary multi-year drought. The accumulated precipitation deficit over the course of the ongoing drought is unprecedented in California’s century-long observational record, and when the additional drying effects of record-high temperatures are taken into account, the 2013-2016 event may in fact be the most severe in a millennium. The amount of water stored in the critically important Sierra Nevada snowpack reached its lowest level in over 500 years in 2015, and the loss of groundwater in the state’s aquifers has literally moved mountains. Drought-related impacts—including decreased agricultural and urban water availability, elevated wildfire risk, dramatically increased tree mortality, adverse effects upon riverine and marine ecosystems, and infrastructure damage to roads and pipelines —have been widespread. Over the past several years, California weather watchers have become well acquainted with the now-infamous “Ridiculously Resilient Ridge” of atmospheric high pressure—the unusually persistent atmospheric anomaly responsible for redirecting winter storms over the Pacific and ultimately bringing record-breaking warmth and dryness to the Golden State. Like a boulder displacing a narrow stream of water, this sluggish atmospheric feature consistently deflected the storm track to the north of California during the typical “rainy season” months of October to May. As a result, much of the state was left high and dry—even during what is typically the wettest time of year. California receives the majority (66%) of its annual precipitation during just four calendar months (December-March), with less than 5% falling during the summer. Since the state lies just south of the typical Pacific storm track during winter, the region relies heavily on rain and snow deposited by storm systems arriving during short-lived southward dips in the jet stream along the West Coast. The most important of these storms are associated with “atmospheric rivers”—narrow plumes of concentrated atmospheric water vapor that can bring very heavy precipitation when they move onshore and interact with California’s mountainous terrain. Remarkably, most of California’s precipitation in a typical year falls over the course of a relatively small number of strong storms. This striking dependence of California’s entire water supply upon the occurrence of just a few atmospheric river events each winter means that a surplus or deficit of just one or two such storms can quickly increase the risk of flood or drought in any given year. As a result, seasonal-scale shifts in the Pacific storm track associated with unusually persistent winter ridges are the most common cause of California droughts—since there is little opportunity to make up for accumulated winter precipitation deficits during the rest of the year. 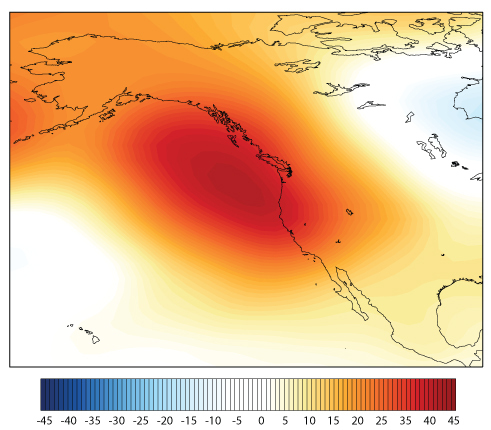 Since seasonally persistent atmospheric anomalies are so strongly tied to drought (and other meteorological extremes) in California, we investigated whether North Pacific pressure patterns similar to those which occurred during California’s most extremely dry, wet, warm, and cool October-May periods between 1948 and 2015 were occurring more frequently in recent decades. We found that certain unusual atmospheric patterns are indeed occurring more often. Most notably, patterns similar to those during California’s extremely warm and dry years of 2013-2014 and 2014-2015—years during which the Ridiculously Resilient Ridge rose to prominence—occurred more frequently over the past three decades. These years were characterized by unusually low pressure over the Pacific north of Hawaii and a very strong ridge of high pressure along the entire West Coast of North America, extending from southern California all the way north to the Alaskan arctic. 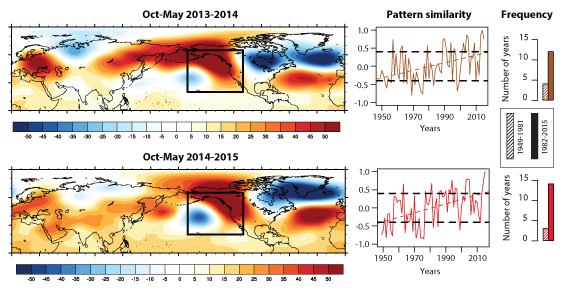 Left column: Maps depicting anomalous pressure patterns over the Northern Hemisphere during the 2013-2014 and 2014-2015 “rainy seasons,” including the Triple R. Middle column: Similarity over time of each of the two patterns with the observed pattern in each year. Right column: Change in frequency of highly similar patterns between 1949-1981 and 1982-2015. Adapted from Swain et al. 2016, Science Advances. Interestingly, however, we did not find evidence that large-scale pressure patterns associated with California’s wettest years have become less common. In fact, one of two methods we used in this study suggested that several wet patterns have actually increased in recent decades, while the other suggested little change. Therefore, while there is high confidence that patterns conducive to extreme warmth and dryness in California are occurring more frequently, this increase in patterns conducive to drought is not occurring at the expense of those associated with California’s wettest years. We also found little change in the occurrence of atmospheric patterns leading to California’s most extremely cool years, despite a large increase in actual temperatures across the state. This suggests that the majority of California’s observed warming trend arises from a more uniform warming trend across all years, which adds to the effect of extremely warm seasons like 2014-2015. In addition to changes in the frequency of atmospheric patterns associated with California’s most extreme years, we also found substantial changes in the average atmospheric configuration over the North Pacific. In a typical year, the West Coast of North America roughly coincides with the position of a preexisting high pressure ridge during winter—which accounts for the fact that eastward-moving Pacific storms that appear destined for California often “veer north” before reaching the state. Between 1948 and 2015, however, we found that this West Coast ridge has become notably more pronounced and increasingly persistent from month to month. The spatial structure of this long-term trend in middle-atmospheric pressure strikingly resembles that of the Ridiculously Resilient Ridge. Map depicting the contribution of Oct-May temperature changes in the lower half of the atmosphere to changes in middle atmospheric pressure (500 mb geopotential heights). Red and orange shades show where thermal expansion due to warming have caused middle atmospheric pressure increases (meters/year). Adapted from Swain et al. 2016, Science Advances. But why have middle atmospheric pressures been increasing at a greater rate along the West Coast than elsewhere over the Pacific or North America? We confirmed that regionally-enhanced warming of the lower atmosphere is primarily responsible for the observed increase in the average strength of the West Coast winter ridge. The physical reason for this is that the “thickness” of the Earth’s atmosphere in a particular region is proportional to temperature—in other words, warmer layers of the atmosphere take up more space than cooler ones, which occurs because air expands when temperatures increase (all else being equal). The particular spatial pattern of warming turns out to be critically important here—if temperatures had warmed by the same amount everywhere, there would be no change in the “sharpness” of the ridge. But because temperatures along the West Coast warmed much more than those in adjacent regions, the overall increase in middle atmospheric pressure reached a local maximum there. A number of studies have already shown that the long-term temperature trend associated with global warming has increased the likelihood and severity of drought in California—even in the absence of significant changes in precipitation. Our new work demonstrates that the increasing frequency of atmospheric patterns conducive to extremely low precipitation and extremely high temperatures California is likely causing a further increase in drought risk on top of that contributed by more gradual long-term warming. In the present study, we aren’t able to trace the exact cause of this increase in patterns similar to the Ridiculously Resilient Ridge, but we do find that the observed pattern of locally-enhanced atmospheric warming near the West Coast has led to increasingly strong and persistent winter “ridginess” overall. Other scientists have presented evidence for a rather wide variety of potential causes of the California drought—including unusual tropical Pacific Ocean warmth, random atmospheric variations, and even the dramatic loss of Arctic sea ice. Several studies have specifically addressed the potential role of global warming in increasing the likelihood of West Coast ridges, but at this point it remains unclear which of these potential causes is most influential. I will probably have more to say on this topic in the coming months as our research continues. 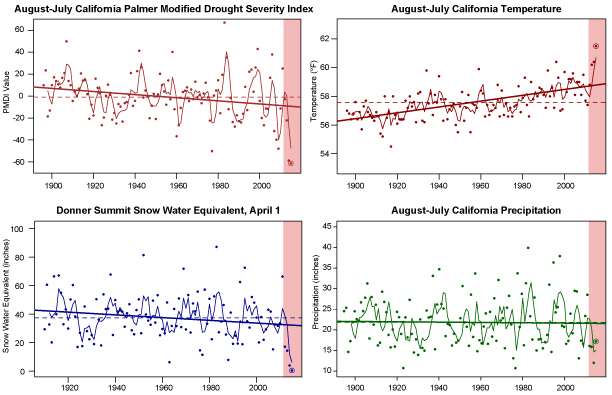 Long-term trends in California drought severity (upper left), temperature (upper right), Sierra Nevada snowpack (lower left), and precipitation (lower right). The red shaded regions depict the 2013-2015 drought. Adapted from Swain 2015, GRL. Finally, it is worth noting that climate model projections for 21st century California depict a much warmer future, likely characterized by increasingly large swings between dry and wet conditions. Our new findings support the notion that that the atmospheric patterns conducive to extreme California drought are indeed increasing, but that patterns conducive to very wet years may also be increasing. It is fascinating that such large changes in the character of California precipitation are occurring despite little or no long-term change in average precipitation—which highlights the critical importance of considering changes in the most extreme years when planning for the future.